According to the lunisolar Chinese calendar, the Year of the Dragon has come to a close and we are beginning the Year of the Snake. In honor of the Chinese New Year I present to you a very small Chinese robe from the collection of the Textiles Department. This late 18th century robe is made of silk, enhanced by metallic threads and boasts a pattern comprised primarily of dragons punctuated by blue and green clouds, flaming pearls, bats and other auspicious symbols. The five-clawed dragon and bright yellow coloring are both symbols of the Emperor of China, and the robe itself was more than likely an imperial donation used to clothe a statue of an emperor in a Taoist temple. The structure of the pattern and specific motif on this robe can be dated to the Qing Dynasty (1644 -1911 AD). However, dragon robes appeared in China as early as the Tang Dynasty (618-906 AD), and were worn exclusively by the emperor or empress and those in the imperial court to communicate royal, and eventually, military rank. These fantastic and sumptuous robes have been an evolving fixture of Chinese court culture and dress ever since that time, and the iconographic importance of the dragon dates back further still. Though these robes are worn and used much less frequently in contemporary Chinese culture, it is not surprising the allure of the robe and the compelling visual interest in the patterns have found their way into the work of contemporary fashion designers from other cultures: most recently and notably in the work of Belgian designer Dries Van Noten. 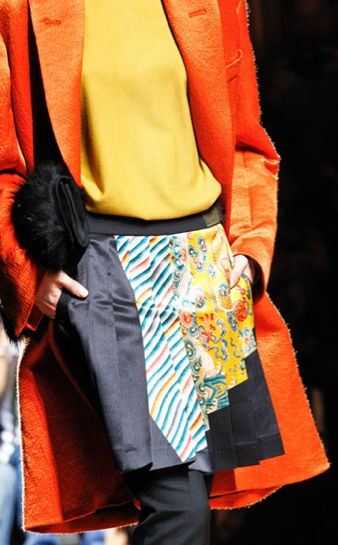 Van Noten is known for adapting the patterns of other cultures, but in his collection for Winter 2012/2013 he did nothing to alter the patterns of the Chinese robes he integrated into his line. Van Noten selected works from the Victoria & Albert Museum in London. Photographs of robes from the collection were digitally printed on fabric and integrated into many of his highly modern garments, introduced on the Paris runway in February of last year. As illustrated in the photographs here, Van Noten deconstructs the traditional and very exclusively worn motifs and rearranges them in highly geometric ways. Although he disrupts the intended message and use of the centuries-old symbols, Van Noten mimics the diagonal patterning of the multicolored bands found at the bottom of these robes and highlights many of the auspicious symbols that find a home in the patterning of imperial Chinese textiles. 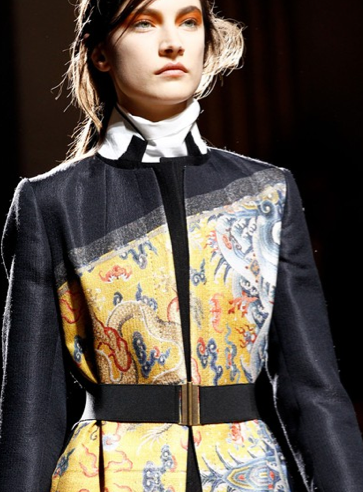 Van Noten’s interesting repurposing and beautiful integration of Chinese patterning with clean, modern lines pays homage to a rich cultural tradition, and the collection having debuted in the Year of the Dragon makes it all the more alluring and appropriate. Laurel McEuen is a candidate for a Master’s degree in The History of Decorative Art and Design offered by the Smithsonian Cooper-Hewitt, National Design Museum and The New School for Design. Laurel is also a Teaching Assistant at Parsons in The History of Graphic Design), The Art of Viewing Art, and Modernism & Politics. In addition to freelancing at the Whitney Museum of American Art, Laurel has held internships at Christie’s, The Museum of Modern Art, The Metropolitan Museum of Art, The Whitney Museum of American Art, and the Museum of Fine Art, Houston. She holds a bachelor’s degree in art history from Southwestern University. Robe. China, late 18th century. Tapestry-woven silk and metallic yarns. Museum purchase from Au Panier Fleuri Fund.